Sigh. “I’d love to go snowshoeing, but…” Sometimes it’s not will or equipment that holds us back, but company for our outdoor activities, especially in winter when there are weather risks and it’s not sensible to go out alone. So how do you go about finding snowshoeing groups near you? Here’s a list of 12 possibilities for finding local group snowshoe outings. Although the details reflect possibilities scattered widely around the US, the list is generic and should give you some ideas for just about anywhere. You betcha. Many snowshoeing groups go out gratis, and many loan you the snowshoes if you don’t have your own. At others, you might have to pay a mini-fee for the loaners and perhaps cost-sharing for the ride to the trip location. Just look around! Not sure about the whole snowshoeing thing? If you need to do a little more reading about how to get started, you’ll want Get Started With Snowshoes: Q&A For Outdoor Seniors. #1 A state park. Quechee? #2 A national park facility, even if it’s obscure! The photo is at Sleeping Bear Dunes National Lakeshore, but how about the out-of-the-way home of a famous sculptor in Cornish NH and Marsh-Billings-Rockefeller National Historical Park in Woodstock VT? They take groups out snowshoeing as a way to learn about woodland ecology and identifying animal tracks. Photo at top. Like LL Bean, which regularly books snowshoeing groups. But LL Bean’s not the only one by any means. For instance, a hiking group that likes to be active in winter, when conditions don’t allow for hiking? Hmmm…The Minnesota Hardy Hikers out of Savage MN. Try this one in Massachusetts. The Obsidians out of Eugene OR is a nonprofit with a loooong history. It offers outings all year round, including on snowshoes. A mountaineering organization is a great way to learn best practices in the outdoors in all four seasons. Like the one below left, Canaan Valley National Wildlife Refuge WV. How about joining the Lewis and Clark National Forest get-together in the photo above right? #9 A for-profit venture such as FitMaine. FitMaine is link-central for Maine active events of every description. If you’re looking for something different, check out the moonlight snowshoeing groups. The Pacific Northwest often has deep snow, and Bend OR is in it. See all those snowshoe- clad folks? You could be right there with them. A night time owl prowl on snowshoes? Awesome! Before you toddle off on the white stuff, group company notwithstanding, let’s not forget it’s crucial to stay dry and warm. This means, above all, wear waterproof boots, take trekking or ski poles, layer up appropriately (NO COTTON), and pull on gaiters, if you have them. You’ll need extra clothing in your day pack in case you get held up and carry your “essentials”. Make sure the trip you choose is suited to your abilities. You can always check with the leader or organization if you’re not sure. Do some research on snowshoeing groups and get out! Snowshoeing is a fabulous activity for enjoying winter outdoors and getting exercise no matter your fitness level. So, check out one, two, three possibilities from this list of 12, register, lace up your boots, snug into your snowshoes, grab your poles and off you go! If you have more ideas for low-budget (especially free) snowshoeing groups, leave a comment so everyone else can benefit from your find. Photo credits. Featured image, Snowshoeing at Saint-Gaudens National Historic Site: Public Domain by NPS. Vermont State Parks snowshoeing, Quechee: Vermont State Parks. Sleeping Bear Dunes National Lakeshore snowshoeing group: CC BY 2.0 by Sleeping Bear Dunes National Lakeshore via Wikimedia. Great day for a tour, Canaan Valley National Wildlife Refuge: CC BY 2.0 by US Fish and Wildlife Service via Flickr. 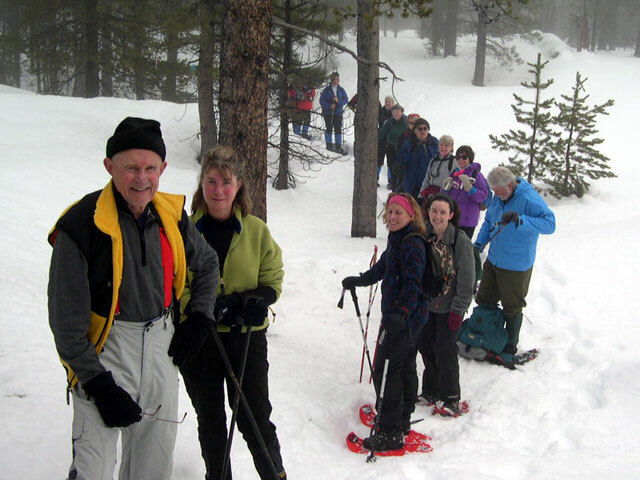 Snowshoe group, USFS Lewis and Clark National Forest: Public Domain by USFS. Bend OR Parks and Rec Snowshoeing Groups: ©Robert Speik, All rights reserved, used with permission. Snowpeople, hz2568: CC BY 2.0 by Mark Goebel via Flickr.